US Ambassador to the UN Nikki Haley has said that the right of return of Palestinian refugees displaced since 1948 is an issue that should be taken “off the table”, according to the Times of Israel. 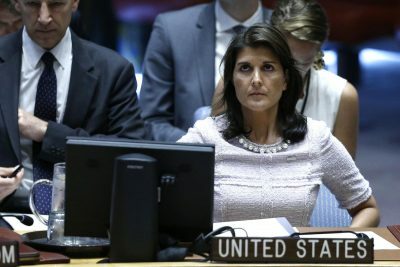 Commenting at an appearance at the Foundation for the Defence of Democracies, a pro-Israel think tank based in Washington DC, Haley suggested on Tuesday that the Trump administration would consider an official rejection of the Palestinian demand that all refugees who were displaced as a result of the Nakba (Catastrophe) and their descendants, be allowed to return to their ancestral homeland following a peace deal with Israel. “I absolutely think we have to look at right of return,” Haley told attendees, before agreeing that the issue should be taken off the negotiating table. Earlier this week, Israeli media sources reported that the Trump administration is allegedly planning to release information on the US government’s official position on the right of return in the coming days. They are expected to argue that only half a million Palestinians can be considered legitimate refugees, and will reject the UN designation that gives refugee status to the children of those expelled. Haley also referenced US aid cuts to Palestinian refugee agency UNRWA which estimates that there are at least five million Palestinian refugees alive today, a figure Haley disputed. “We will be a donor if [UNRWA] reforms what it does … if they actually change the number of refugees to an accurate account, we will look back at partnering them,” she argued. Yesterday, a report by Foreign Policy revealed that the Trump administration has decided to “end funding altogether” to UNRWA, a move expected to worsen the agency’s financial crisis. The report follows revelations earlier this month that US President Donald Trump’s senior adviser and son-in-law, Jared Kushner has been pushing for the refugee status of thousands of Palestinians to be removed in an effort to halt the majority of UNRWA’s operations. Israel has argued that UNRWA is seeking to destroy Israel through demographics by supporting Palestinian refugees in multiple locations, which together outnumber the Israeli population. Consequently any one-state solution would see a Palestinian majority in the Jewish state, a situation Tel Aviv wishes to avoid. Israeli officials, including Prime Minister Benjamin Netanyahu, have encouraged the US to slash Washington’s donations to UNRWA, despite international concern over the worsening of the humanitarian crisis in Gaza.